The Oster TSSTTVMNDG Digital Large Capacity Toaster Oven is designed to be large enough to handle large dishes while still being compact enough to save counter space. It offers convection baking so that heated air is circulated around baked items, which allows them to be browned in less time. 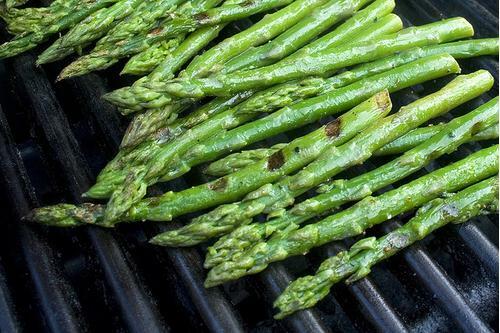 The use of such technique can reduce cooking times by as much as 30 percent. 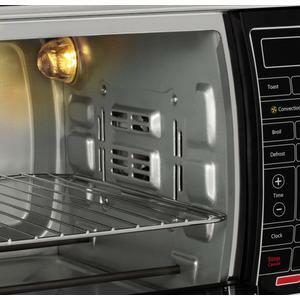 Additionally, there are a number of functions that offer users precise control over how their food is baked. For items like toast and English muffins, the settings allow control over the shade of the toasted item. 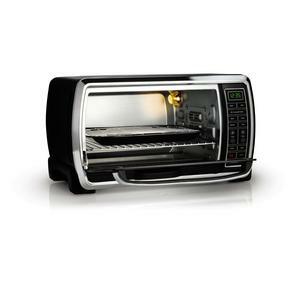 The Oster TSSTTVMNDG Toaster Oven can broil foods at any temperature and can also operate at low heat allowing it to serve as a food dehydrator as well as an oven. The preset functions allow users to set the oven easily in order to get different types of food to the desired degree of doneness. The preset functions include a toast function and a pizza function. 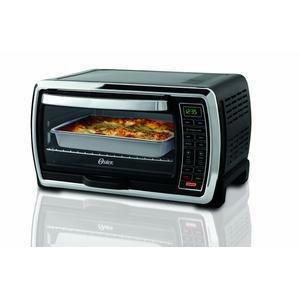 The Oster TSSTTVMNDG Toaster Oven can also broil or defrost foods. One of the common problems with ovens that have no convection feature is uneven cooking. This is because the oven’s heat is not consistent throughout its interior. The convection fan in this oven circulates air to prevent this from happening. Cleaning is one of the big hassles with ovens of any size. The Oster TSSTTVMNDG Toaster Oven makes this easier with its nonstick interior walls. Food that splatters will be easy to remove with a damp cloth. Users should note that it is important to unplug the oven and allow it to cool before attempting to clean it. The crumb tray is removable which makes cleaning a breeze. If you are among the lucky few who has a dishwasher at your disposal, it is good to note that the removable racks are dishwasher safe. You can do everything from roasts to cakes with this appliance. The interior has enough room to fit six slices of bread for toasting. Being a convection oven it is, you can be sure that those slices of bread will toast consistently and to the user’s preferred shade. Aside from the various functions, the oven can fit a 13×9 pan (without handles), which means that it serve as a functional backup to your main oven. No Oster TSSTTVMNDG toaster oven review would be complete without a look at its appearance. 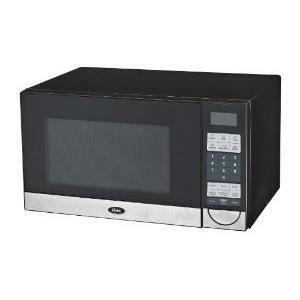 The Oster TSSTTVMNDG Toaster Oven is sturdy and has a black body with stainless steel accents. The door has a big glass window and an easy-to-grip handle. 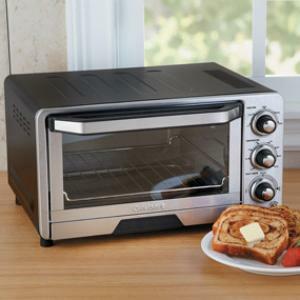 This toaster oven is lightweight but has the look of a high-end appliance and should fit perfectly in most kitchens regardless of the design scheme. 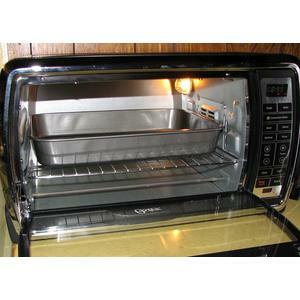 As with many toaster ovens, the exterior can get warm if it is in use for extended periods. Instead of coming from the back or the side of the oven, the power cord comes from the bottom. While this design does make it easier to place the appliance in a corner, it may seem awkward to some users. One downside of the compact size is the fact that 13×9 pans are the largest it will take. Some 13×9 pans with large handles may not fit or may be difficult to remove while hot. While it has all of the instructions for using the oven, the manual does not come with recipes or baking charts. I know most people would skip the manuals these days. But I’m one who still faithfully refer to my manuals, especially when it comes to toaster. In Oster toaster oven reviews, users have stated that this toaster oven serves as an excellent alternative to using their main oven. 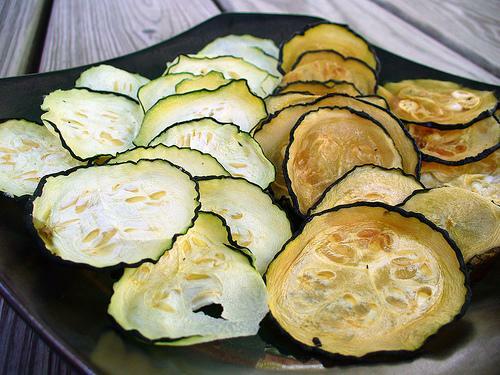 It is most useful for small items that would be a waste of space and energy in a standard-sized oven. The small size also makes it the best oven for kitchens with limited counter space and for users who simply do not like their counters cluttered. Another feature that many users like is the Oster TSSTTVMNDG’s ability to reach and maintain the correct temperature. It has been found to be accurate within ten degrees of the temperature to which it has been set, which is very accurate for an oven in its price range. Is Oster TSSTTVMNDG a Good Toaster Oven Buy? The Oster TSSTTVMNDG Toaster Oven is a compact, lightweight oven that provides a lot of high-end features at a reasonable price. Its versatility and the good reputation of the Oster brand make it the perfect appliance for apartment dwellers or homeowners who need an extra oven to complement their main one. So, do you think this toaster has earned its place to be among the best toaster oven? Let us know what you think. 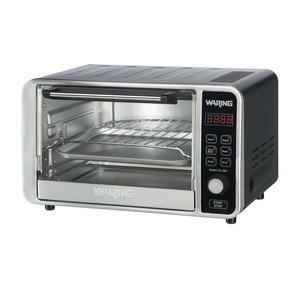 Any Good Reason to Buy Waring Pro TC0650 Digital Convection Oven? 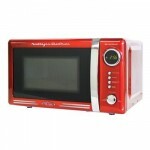 Have You Heard of Nuwave 20326 Infrared Oven? 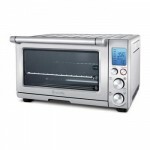 Let’s See Why Cuisinart TOB-40 May be the Best Toaster Oven How Much to Expect from Oster OGB5902 Microwave Oven?